This post showed up on my outside.in Radar (http://outside.in/radar), and I just want­ed to say thanks for link­ing to the 360 smith place page on outside.in. It’s an excel­lent exam­ple of how to use our site. that is some seri­ous bull right there. i don’t even rec­og­nize the space! and yes, it used to be a space where you could stand and watch the F train rolling in and smoke the last of your cig­a­rette. brook­lyn is becom­ing mall­hat­tan. Well, that was fast — it seems that the quick pas­sage of the nar­row streets zon­ing amend­ment for Car­roll Gar­dens has brought con­struc­tion to a “halt”:http://www.gowanuslounge.com/2008/07/25/that-was-fast-360-smith-street-comes-to-a-grinding-halt/. Because the project’s foun­da­tion is only 20% com­plete, it looks like the devel­op­ment will have to scale back its height and bulk, in order to con­form with the new reg­u­la­tions. 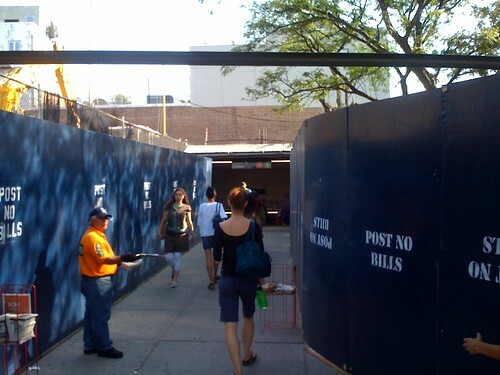 And, the Car­roll MTA entrance “will remain open”:http://www.gowanuslounge.com/2008/07/25/that-was-fast-2-carroll-street-station-to-stay-open/, for now.